There are plenty of trends that will Shape the Digital World and the future of the web is going faster and complexer than ever. Between 2008 and 2009 the mutations on the web landscape were massive. If we consider what happened in just a few years it is impressive how the web managed, mapped and indexed by Search Engines still with security breaks changed from being used by a small amount of people with access to it, to become a massive flow of people navigating on it for communications, entertainment and trading evolving faster than anything in the history of technology and its universe. For instance let us compare the number of websites in 1996 that was around 250.000 and now that according to Netcraft, the number of websites added to Internet has increased from 185.5 million at the beginning of 2009 to 231.5 million in April 2009, an increase by 46 million in just a few months. This should makes us think seriously. That’s more than the number of websites added in the entire 2008 year when the number of websites increased by 29.9 million. According to Netcraft, most of this huge increase is due to websites served by the blogging service of a Chinese social network QZone, according to reports by Royal Pingdom. In a few years one moved into a web landscape with 1.668.870.408 billion people online in June 2009. Furthermore there are now around 30 billion web pages out there… Also 70% of the users of the web are non English speakers (a completely multilingual net), although paradoxically at the moment the biggest players in the web are based in the USA (although that is changing). These are the world usage of the Internet in 2009 according to (http://www.internetworldstats.com/stats.htm). NOTES: (1) Internet Usage and World Population Statistics are for June 30, 2009. (2) CLICK on each world region name for detailed regional usage information. (3) Demographic (Population) numbers are based on data from the US Census Bureau . (4) Internet usage information comes from data published by Nielsen Online, by the International Telecommunications Union, by GfK, local Regulators and other reliable sources. (5) For definitions, disclaimer, and navigation help, please refer to the Site Surfing Guide. (6) Information in this site may be cited, giving the due credit to www.internetworldstats.com. Copyright © 2001 – 2009, Miniwatts Marketing Group. All rights reserved worldwide. In this scenario let have a look at the curious graphic of 2006. In here the authors in a very balanced way managed to match the elements of the web’s next generation that in the basic are still the same 2 years afterwards. The main differences are in the cloud computing and in the social media, micro-blogging applications and technologies that at the present are more and more important and going through an exponential growth. 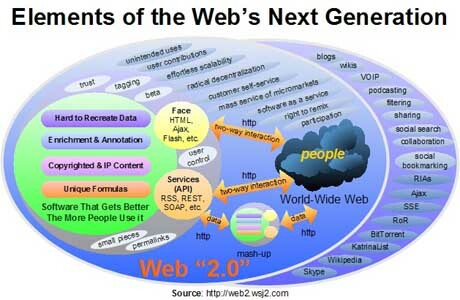 In this train of thoughts let us have a look at the term Web 2.0 a term started by O’Reily in a brainstorm where he compared the features of web 1.0 and 2.0 this was back in 2001. The term web 2.0 is still up in 2009. But the present web is is based in the mix between Search and with Social engines with technology moving for not just ways of indexing but ways of communicating between profiles and applications pushing semantic and behaviour to the daily life. 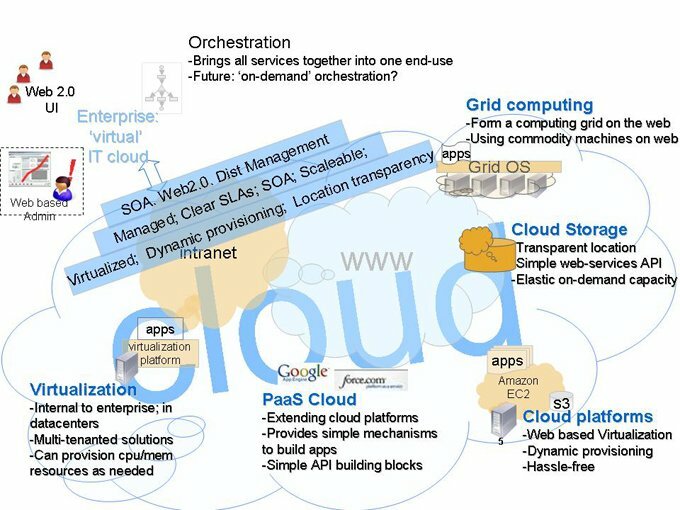 Also the new landscape of cloud computing is pushing more and more technological and interactive challenges. In the space of around 10 years life offline is being literally migrated online: communications, trading, socialising, organisational, education, entertainment, finance, trading… And it is only in its beginning, if one sees the new platforms and the mobile new challenges that are already there and the increase of numbers and complexity of the things done in the web the sophistication of users, localisation, the new products and technologies and the number of websites, landing pages and countries. If one looks at the history of the web things started according to some sources (there are others that goes to the beginning of the 20Th century with a lady…) at around 1945 when Vannevar Bush wrote an article in Atlantic Monthly about a photo-electrical-mechanical device called a Memex, for memory extension, which could make and follow links between documents on microfiche. Then almost two decades after in the 1960s Doug Engelbartprototypes an “oNLine System” (NLS) which did hypertext browsing editing, email, and so on. He invented the mouse for this purpose. The next main step was two decades afterwards in the 1980s with Tim Berners-Lee. This scientist called by a lot of people the father of the web (or at the least the more recent web as we know it) while consulting for CERN wrote a note book program, “Enquire-Within-Upon-Everything”, which allowed links to be made between arbitrary nodes. With this document started then the currency of the Internet, the links. A currency that goes until the present where the links and link building (thus the importance of link building and SEO). TimBerners-Lee managed that programme with each node with a title, a type, and a list of bidirectional typed links. Then Tim wrote a global hypertext system in 1990 in the following. And Tim Berners-Lee started working on a hypertext GUI browser plus editor using the NeXTStep development environment. He curiously made up “WorldWideWeb” as a name for the program. In 1991 the project was presented and in Dec 12 Paul Kunz installed the first Web server outside of Europe, at SLAC. Then in January 1994 O’Reilly, Spry, etc announced the “Internet in a box” product to bring the Web into homes. In March Marc Andreessen and colleagues left NCSA to form “Mosaic Communications Corp” (later Netscape). And then Internet started going public and came Yahoo, some years after Google and all the others followed. And we are now in 2009 an interesting and curiously year for all purposes. In a year and time of Financial clash, economy in a chaos and nevertheless the fact is that this date has been one of the most active in the web development with Twitter and Facebook making a real time revolution and at the same time with old players such as Amazon, Google, IBM using the web to get more and more and go to new stages. And at the moment the features of web 2.1, 2.0 and 3.0, in whatever that can be materialised start all mixing. The Wikipedia definition of Web 2.0 is “a second generation of services available on the World Wide Web that lets people collaborate and share information online.” Wikipedia, being a user-generated knowledge base, is itself an interesting mix of web 1.0 and Web 2.0. In the ecommerce context, Web 2.0 includes leveraging social commerce on a given site; blogging / pod-casting and participating in social networks like LinkedIn, Slideshare, Youtube, Facebook, Twitter — and anywhere you or your customers can create and share content. Experts in e-commerce and retailers often wonder what are the Web 2.0 / social media activities to be involved with, so it is interesting to have a look at the top 10 Web 2.0 activities for ecommerce based on its business impact. And I add: the use of e-commerce applications and widgets, CRM programmes and analytics systems, (that are each time more the key going forward). Overall if organizers want to compete with Coachella they will have to have more cohesion and maybe even a change of venue when the show comes around again. Nobunaga’s assassination occurred just a few months after the defeat of the Takeda. Often new installations cause the trouble and taking it out will resolve the trouble.